I'm probably opening a can of worms but I'll still ask. The mast bumping discussion came back up in the office the other day and it's got me curious. Are there any design differences in Bell Helicopters that contribute to fewer mast bumping occurrences in recent history (post the army releasing their training video)? Fewer absolute beginners learning on Bell machines - usually have a few more smarts before getting into a Bell than a Robinson. And you will probably only learn in a Bell in a more controlled environment - military perhaps, rather than a civil school where the "instructor" only has 100 more hours than the student. There are differences in the hub design. Robinson helicopters incorporate their patented *Tri-hinge Rotor Hub. Whether this contributed to more frequent Mass Bumping, in-flight brake-ups, is yet to be determined by more independent dynamic testing. To date, these in-flight breakups have mostly been contributed to pilot error or turbulence. What we do know is these in-flight breakups have bitten both low and high time Robinson pilots under unusual circumstances. You have to remember Robinson’s initial goal was to build a light, low cost, and responsive helicopter. It often comes down to trade-offs and compromises that may or may not have been realized in the beginning. The jury is still out. “In a departure from the traditional semi-rigid rotor system design, Frank Robinson used a coning hinge on each blade when designing the R22 in the 1970s. When rotor blades produce lift (especially under high load or low rotor rpm) they flex upward (coning). Although some mistakenly refer to this as a flapping hinge, it is used for blade coning. Previous rotor systems used a fixed coning angle built into each blade. Robinson’s design allows the coning angle to vary according to different conditions such as rotor speed, acceleration, and weight. Coning via blade bending places a high stress load at the blade’s root. 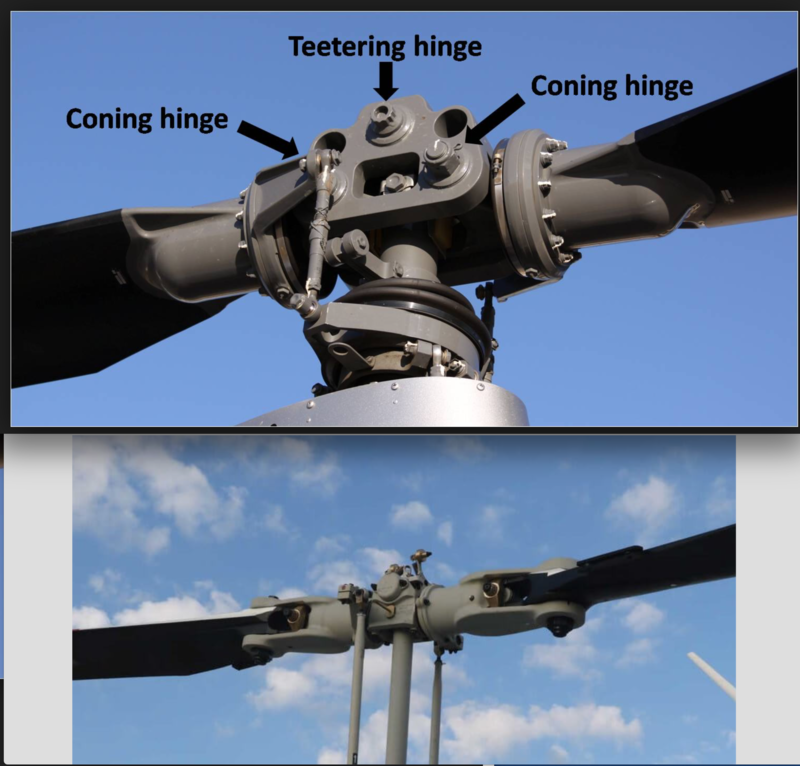 The coning hinge relieves this stress, reducing the amount of reinforcing required and making for a lighter, easier to manufacture rotor blade. Additionally, the reduced bending of the rotor blade at its root allows the pitch-change axis to be better aligned with the blade’s centerline. This reduces the forces across the hub, pitch change bearings, and the rotor blades and, as such, decreases shake and feedback in the cyclic control. Edited by iChris, 14 October 2018 - 21:49. "The Robinson rotor head will mast bump sooner than other types and the reaction from mast bump will be much quicker and more severe," Tom McCready, an engineer and veteran accident investigator, told the Herald. In other helicopters, you may walk away with a fright and a dented mast, says the former CAA investigator. Mast-bump accidents in Robinsons in New Zealand have been catastrophic. Kurt Robinson, who replaced his father, Frank, as president and chairman of the company in 2010, says placing the helicopters on the watchlist was unfair because it didn't allow time for changes by the CAA to the training required for pilots of Robinson helicopters to take effect. Trainee pilots now have to do a Robinson safety refresher every three months, qualified pilots every two years. "I'm hopeful now that will make a pretty dramatic difference," Robinson says. "We have these helicopters flying all over the world and we did see a higher incidence in NZ. I think a lot of it is the particular manner in which the pilots fly." Kiwis may be more inclined, he says, to do a cyclic "pushover" that can risk low-G, a manoeuvre banned in the United States because it can induce mast bumping. A Robinson aircraft is like a high-performance sports car, he says. "It needs to be handled properly. If done so, in the right hands, the aircraft performs beautifully. But if the proper training isn't done or if people handle the aircraft incorrectly then, yeah, you can get into trouble real fast." Mast-bumping isn't the cause but part of the accident sequence, he says. "You've gone too far." Full story at: Undetermined reasons: Are Robinson helicopters too dangerous? Edited by iChris, 11 October 2018 - 15:09. That’s funny. It’s more like a Hyundai than anything related to a sports car. Cheap, simple and fairly reliable but not made to do anything sporty and when pushed hard it will fail. This discussion is now confused and without reference (w/ a majority of US posters on this forum) as we have made reference to "sports cars" which is something Americans know little about. Thats funny. Its more like a Hyundai than anything related to a sports car. Cheap, simple and fairly reliable but not made to do anything sporty and when pushed hard it will fail. These pilots may feel differently. Europe builds super cars only the super rich can afford, like the French Cabri, just another little two-seat piston like the Robby, but for some reason way more expensive, bringing flying back to only the super rich! You do realise the "Trans Am" video above exemplifies my statement on Americans not much about sports cars? Damn, what a piece of crap. Why can't the US come up with car ideas newer than the 60's or 70's. Well, I love driving mine! Edited by superstallion6113, 12 October 2018 - 12:56. To drive with a maximum speed of 70mph technology from the 60s and 70s is by far good enough. Thank you for the images and video, this makes sense to me.